When the aircraft engine factory in Munich and the vehicle production plant in Eisenach were dismantled after the war, BMW seemed to have come to the end of the road. Carrying out repairs and producing various utensils, the company nevertheless kept going until motorcycle production started again in late 1948. The frame and running gear of the former R 23 were now combined with a modern single cylinder engine featuring centrifugal ignition control and rocker arm bearing blocks fitted on separate support sleeves. Two other new features were the 4-speed gearbox with ratchet-type foot-shift and a Bing carburetor replacing the former Amal unit. From 1950 the slightly modified 250 cc model was available with a welded tubular frame featuring rear wheel suspension. While the R 25/2 differed only slightly from the R 25, the R 25/3 introduced fundamental innovations. To increase engine power, BMW introduced an intake system carefully optimiZed in length. Also featuring full-hub brakes, 18-inch wheels and a hydraulic telescopic wheel fork, the R 25/3 reached the outstanding figure of 47,700 units produced, which was not topped until the F 650 and R 1100 RT models of the 1990s. A new version of the pre-war R 51 with new, split valve covers and coil springs (replacing the hairpin valve springs), inclined Bing carburetors, improved telescopic fork and larger front wheel mudguard. BMW’s proven frame and running gear then came with new engines with a central camshaft also driving the magnetic ignition. The alternator was fitted at the front on the crankshaft stump. A duplex brake for the front wheel was introduced in 1952, followed by full-hub brakes in 1954. Distinguishable at first sight only by the valve covers and slender mudguards, the new sports machine came with larger valves and carburetors, a modified camshaft, higher compression ratio and needle-bearing rocker arms. Developing 35 hp, the R 68 had a top speed of 160 km/h and was therefore not only Germany’s fastest production machine in the 1950s but also one of the few 100 mph motorcycles of its day. A new generation with swinging arms: the rear wheel was suspended by a longitudinal swinging arm with spring struts, the front wheel by an Earles-type swinging arm also on struts. The wheel dimension was 18" front and rear. Improvements: plate spring clutch, three-shaft 4-speed gearbox with damping unit. Originally fitted with a new suspension, the engine of the R 68 was replaced in 1960 by new power units with considerably improved performance. Both models had steering dampers, and from 1962 onwards, the 600 cc class engine featured a vibration damper on the crankshaft. The single-cylinder engine featuring a new cylinder head was now combined with lightweight suspension and swinging arms. The contact breaker of the R 27 was at the front end of the camshaft, the engine was suspended on rubber blocks. 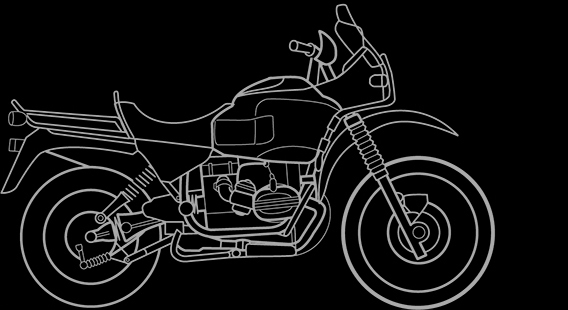 With the comeback of the motorbike, BMW offered a completely redesigned range of Boxers: sophisticated machines featuring a lightweight tubular frame with rear wheel swinging arm and front wheel fork, crankshaft and conrods in anti-friction bearings, alternator, battery ignition, electric starter and throttle butterfly carburetor (from the 750 cc model). BMW’s first model with more than 750 cc, boasting a high-performance engine with Dell ’Orto slide carburetor, 5-speed gearbox, double disc brake on the front wheel and cockpit fairing. 980 cc engine from 1976. Further development stages of the Boxer models: 1973 – 5-speed gearbox and 900 cc class power unit; 1974 – disc brakes, new valve cover and 1000 cc class engine. The world’s first production machine fitted as standard with all-round wind and weather fairing, cast spoke wheels from 1977, rear wheel disc brake from 1978, Galnikal-coated cylinder liners from 1981. 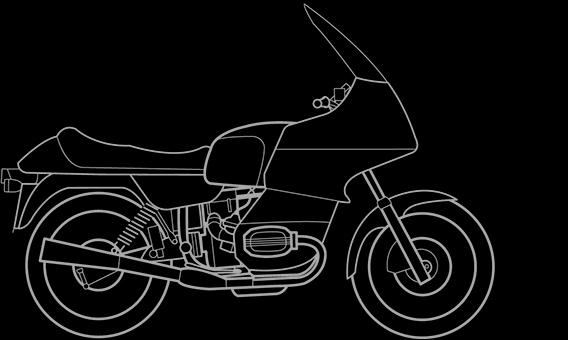 Modifying the top section of the fairing, BMW converted the RS sports model into a long-distance touring machine with extra-high windshield and wide handlebars to give the rider an upright seating position. Rear wheel spring struts with self-leveling. The 500 and 600 cc class with lighter suspension and running gear plus short-stroke power units. For insurance ratings, there was an additional 27 hp version of the R 45 for the domestic market; the R 65 offered more power from 1980. Additional model with smaller headlight fairing and new light-alloy wheels. Following its outstanding success in international off-road racing, BMW’s first production enduro was launched in 1980. It was not only the largest model of its kind at the time, but also the world’s first motorcycle with a single rear wheel swinging arm, the BMW Monolever. To bid farewell to the “old” Boxer, the special edition R 80 G/S Basic was offered in 1996, featuring the classic G/S look but with a state-of-the-art Paralever rear wheel swinging arm. 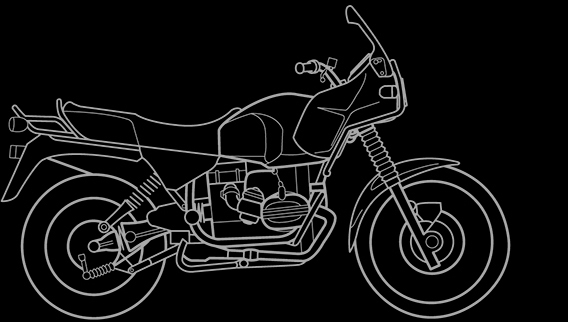 The road version of BMW’s R 80 G/S enduro model also came with a shorter wheelbase and rear wheel Monolever swinging arm. It was fitted with road tires, a smaller front wheel and chrome-plated 2-in-1 exhaust system. Designed and built for the road and featuring the Monolever swinging arm, the new R 80 introduced BMW’s further developed Boxer series. Replacing the smaller Boxers, the R 65 was built specially for the German market with a 27 hp engine. BMW also came back with a full-fairing tourer by combining the new R 80 with the proven fairing concept. A new 1000 cc class model with almost identical styling was then introduced in 1987. In response to the great demand from export markets such as Japan, BMW reintroduced 1000 cc class Boxer engines mounted in the running gear of the new R 80. Initially intended as a special series, the RS became available again as a regular machine. In 1987, the new top model in BMW’s flat-twin series was the R 100 GS enduro with BMW’s extra-powerful 1000 cc engine, providing even more torque thanks to larger carburetors and the new exhaust system. Another feature was the further improved running gear. The rear-wheel swinging arm featured a new BMW patent, the Paralever double-joint swinging arm that eliminated the vertical forces exerted by the drive shaft. The 800 cc class model and the special Paris-Dakar version with a larger tank and long-distance touring features came with the same frame and running gear. 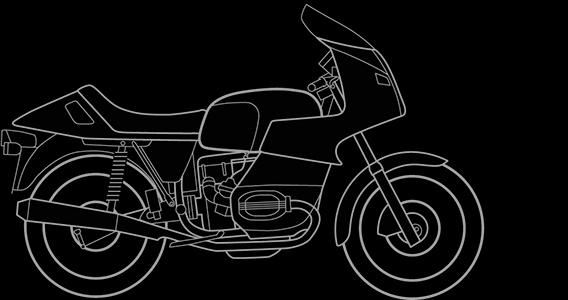 Starting with the 1991 model year, the R 80 GS and R 100 GS had the same fairing as the special Paris-Dakar model. 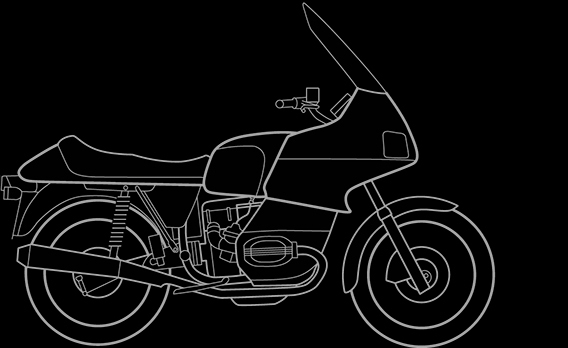 Road version of the GS enduro model in classic style. Since autumn 1990 all R models were available with SAS (Secondary Air System) exhaust management as an option.